For years, a fixture in my International Criminal Law class has been “Where’s Omar?”, a Waldo-inspired examination of all the places that Sudan’s President has visited since the International Criminal Court first issued an arrest warrant against Omar al-Bashir on March 4, 2009. Though he’s wanted on charges of genocide, crimes against humanity, and war crimes alleged to have occurred in the western Sudanese region of Darfur (prior posts), President Bashir has traveled to numerous countries, including ICC states parties like Kenya and nonparty states like post-Gaddafi Libya. 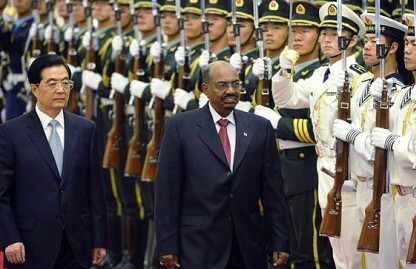 And though the Darfur situation came to the court by referral from the U.N. Security Council, the Council’s never reprimanded host states; indeed, one of the Council’s five permanent members, China, honored Bashir with a state visit in 2011. (credit for AP photo) Soon the United States may become the second P-5 member in that group: Bashir’s requested a visa to attend the just-opened session of the U.N. General Assembly, and as Julian Ku posted at Opinio Juris, an international agreement affords the United States little discretion to deny the request. We’ll soon know whether Bashir will add U.S. entry and exit stamps to his busy passport.